Two newly released surveys show that Denmark and its capital city aren't among the desired destinations for foreign professionals, although a few bright spots did emerge. Denmark’s business and political leaders are once again discussing the country’s need to be more attractive to foreign workers, but two new surveys show that they will have their work cut out for them. InterNations’ Expat Insider 2014 survey puts Denmark as just the 32nd most appealing expat destination, based on criteria including quality of life, finances, the ease of settling in and work-life balance. Denmark’s 32nd place ranking puts it well behind European neighbours such as Luxembourg (which took second place), Switzerland (4th), Spain (7th), Germany (12th), Norway (18th) and Austria (19th). Denmark did however come in two spots higher than Sweden. 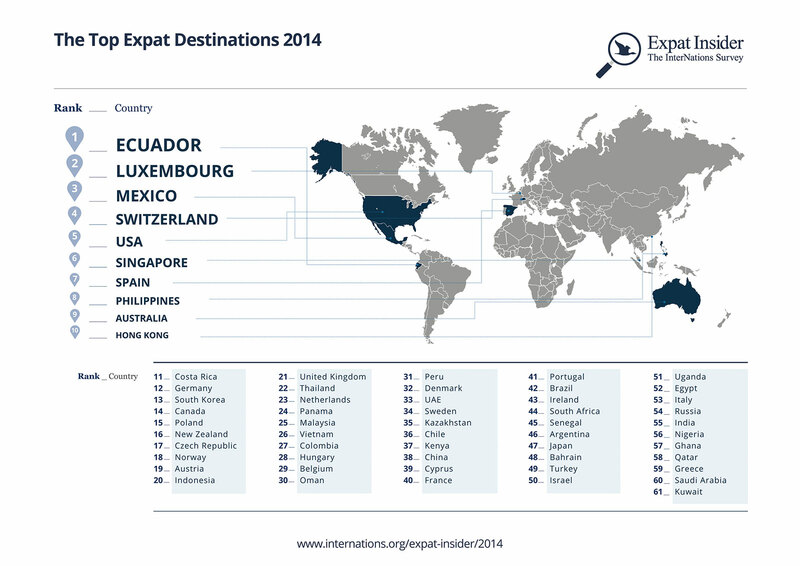 Ecuador was ranked as the top expat destination for 2014 and fellow Latin American countries Mexico, Costa Rica, Panama, Colombia and Peru were also above Denmark. According to InterNations, Ecuador claimed the top spot largely due to its low cost of living, ease of settling in and high levels of respondents’ personal happiness. Despite its middle of the pack finish, the InterNations survey wasn’t all bad news for Denmark. It finished second in the overall category of ‘family life’, and topped the subcategory of ‘family well-being’. “Denmark, the tiny country north of Germany, receives the highest rating for family well-being in general. A whopping 94 percent are satisfied with the health and safety of their children (63 percent even rate this factor ‘very good’). All in all, the country boasts a friendly attitude towards families with children – 90 percent of our participants give Denmark a positive rating,” the report reads. Denmark scored significantly worse in subcategories including the ease of the local language (46th place), the ease of making friends with the locals (59th place) and the cost of living (53rd place). Expats in Denmark are also more likely to live within the ‘expat bubble’ than in other countries. Fifty-one percent of Denmark respondents said that they mostly had expat friends, compared to the global average of 35 percent. Meanwhile, a survey by the Boston Consulting Group shows that Denmark’s capital city is not among the top destinations for global talent. Just 1.6 percent of a total of 203,756 global respondents included Copenhagen among their five choices for cities they would consider working in abroad. That put Copenhagen at just number 28 on the 30-city list, well behind nearby Berlin (6th), Stockholm (19th) and Oslo (22nd).